The American Sephardi Federation has awarded its Pomegranate Award for Lifetime Achievement to the writer and sociologist Albert Memmi at the start of the 22nd NY Sephardic Jewish Film Festival. 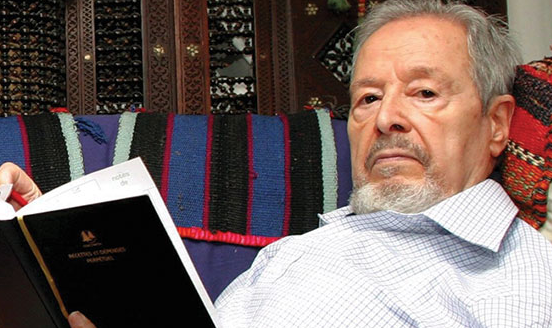 Born in Tunisia into a poor Jewish family, the 98-year-old Memmi is a giant of Sephardi literature of French expression. His works include The Pillar of Salt, The Scorpion, Portrait of the Colonized, and numerous seminal sociological works. Memmi situated his work early on at the crossroads of Jewish, Arab, and French cultures. Seen as a “Prophet of Decolonization,” he strove toward a recognition of multiple identities, the fight against all forms of racism, and wrote about the difficulty of finding a balance between East and West. Recognized by peers, including Albert Camus, Aragon, Jean-Paul Sartre, and Léopold Sedar Senghor, his work is often read in conjunction with those of Frantz Fanon and Aimé Césaire. Due to Memmi’s advanced age, an award ceremony was organized at his home in Paris with authors Colette Fellous and Guy Dugas, coordinator of the upcoming Memmi Centennial in France and Tunisia. Previous recipients of the ASF Pomegranate Award for Lifetime Achievement include André Azoulay, Senior Counsellor to Morocco’s King Mohammed VI; Enrico Macias, the Algerian-born French international recording superstar, and Erez Bitton, the award-winning Moroccan-born Israeli poet. The ASF Pomegranate Award is sculpted by the renowned Baghdad-born artist Oded Halahmy of the Pomegranate Gallery in Old Jaffa and Soho. His book "Jews and Arabs" [Juifs et Arabes] is not mentioned in the article. The book was meant to refute common misconceptions about how well Jews were treated in Arab countries. It is available in French and English and maybe Hebrew and other tongues.